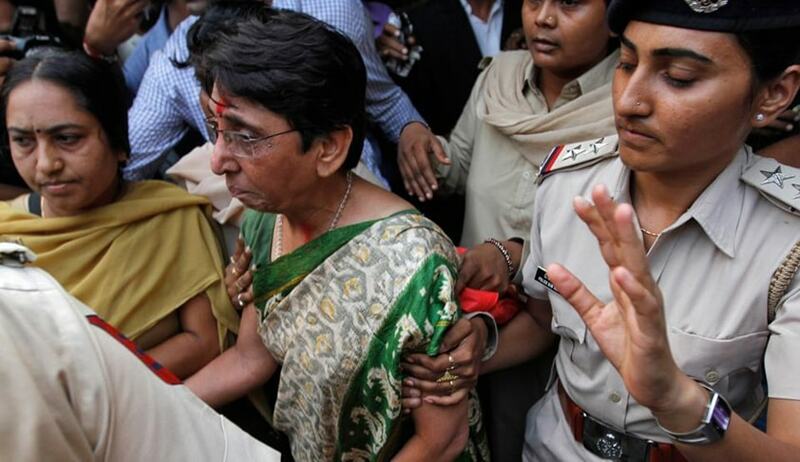 The Gujarat High Court, on Friday, reportedly acquitted former BJP Minister Maya Kodnani in the 2002 Naroda Patiya massacre case. Meanwhile, the Court has upheld the life sentence awarded to Bajrang Dal leader Babu Bajrangi, observing that the charges of conspiracy against him had been established beyond reasonable doubt. The Court also acquitted two others: Ganpat and Haresh Chhara. The trial court had in August 2012 awarded life imprisonment to Kodnani, Bajrangi and 29 others for Naroda Patiya incident of 2002 riots in which 97 people were killed. The trial court had described Kodnani, a sitting BJP MLA and former minister in Narendra Modi government, as “kingpin of riots” in the Naroda area, and had sentenced her to 26 years imprisonment. This is one of the few cases in which the rioters were convicted. 11 appeals were then filed against the order. All convicts had challenged their conviction, while the Supreme Court appointed-Special Investigation Team (SIT) had sought stricter punishment for three convicts, including Bajrangi. The SIT had further challenged the acquittal of seven accused. During the hearing, the High Court had decided to visit the scene of the offence, but had warned the media against “any intervention”, which it had said would amount to interference with judicial proceedings. A Division Bench comprising Justice Harsha Devani and Justice A.S. Supehiya had then reserved its judgment on the Appeals last year in August.